The Phoenix Mini Max features a queen-size 5-inch Lucid-brand memory foam and gel mattress. 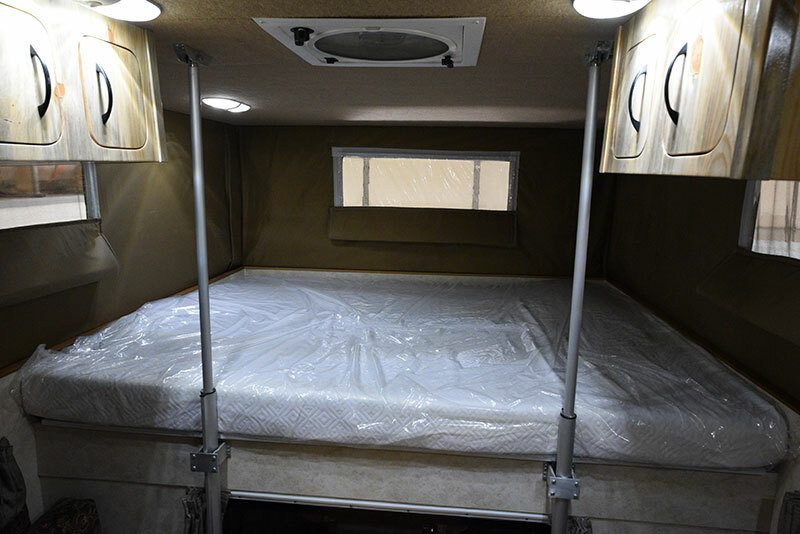 Lucid mattresses are strongly recommended by Truck Camper Magazine readers. We have a similar memory foam mattress in our project camper. Considering the minimal mattresses some RV manufacturers install in their products, the Lucid is a welcome discovery. The metal bars in the photograph above are part of the Phoenix lift mechanism. Mini Max owners would quickly adjust to their location, but newbies may be put-off by these mid-ship obstructions. 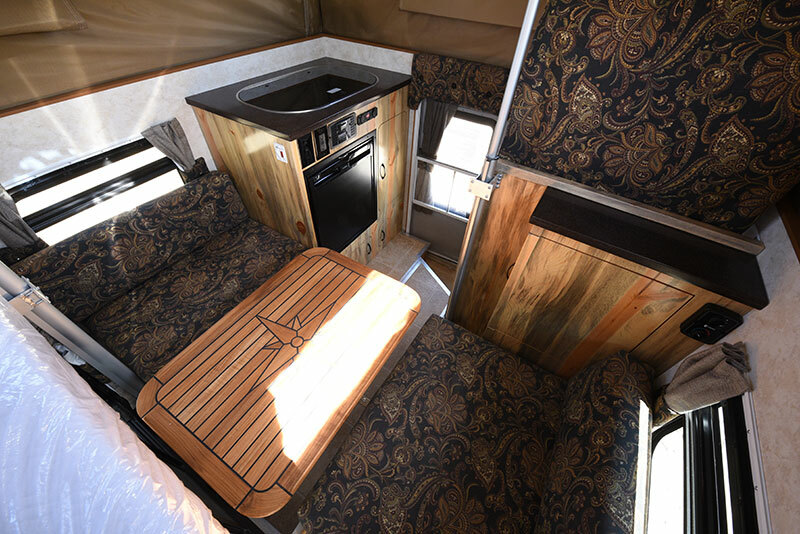 If you’re concerned about this element of the Mini Max design, I highly recommend visiting Phoenix Campers in Commerce City, Colorado. Just be sure to call ahead to make sure they have what you want to see on hand. 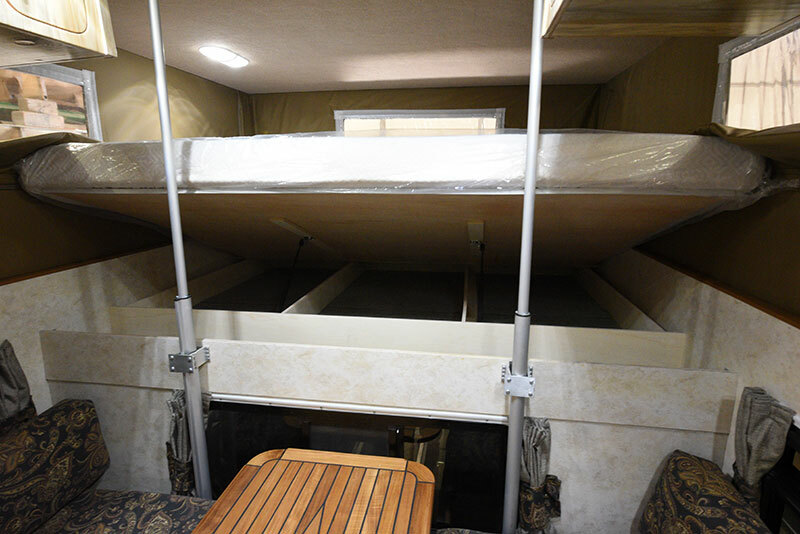 There really isn’t a lot of storage in the Phoenix Mini Max, until you lift the cabover bed. Under the bed there’s a large space for clothing and supplies. This space will no doubt create the bulk of built-in storage for Mini Max owners. Normally I am looking to see a roof fan in certain locations; above the kitchen area, in the bathroom, and possibly in the cabover. In the Mini Max, the Fantastic Fan is dead center in the camper and pretty much hits all those targets – all at once. Here it is, my signature turn-around shot. 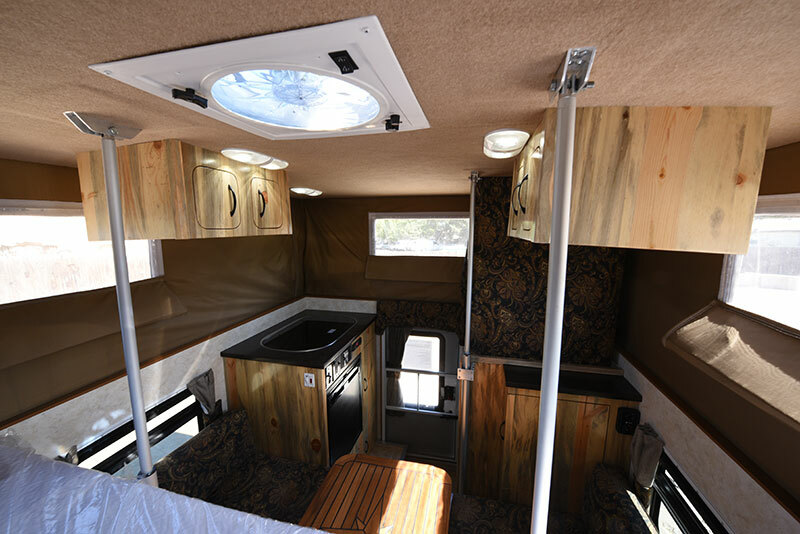 After going through every truck camper I review, I like to look back and take in the camper – just as one would every morning after waking up in the cabover. The Mini Max might be the most appropriately named truck camper on the market. There is no extra space here, but the feature set is simply remarkable for a pop-up camper designed to fit on the back of a midsize truck.